A newly released GUNS N' ROSES commercial on that aired on Friday (November 25) on AT&T's Game Show Network appears to suggest that the band will return in 2017 with more U.S. tour dates. The 30-second clip, which can be seen below, contains footage from GN'R's summer 2016 "Not In This Lifetime" U.S. stadium tour along with the message: "They're back for more in 2017". 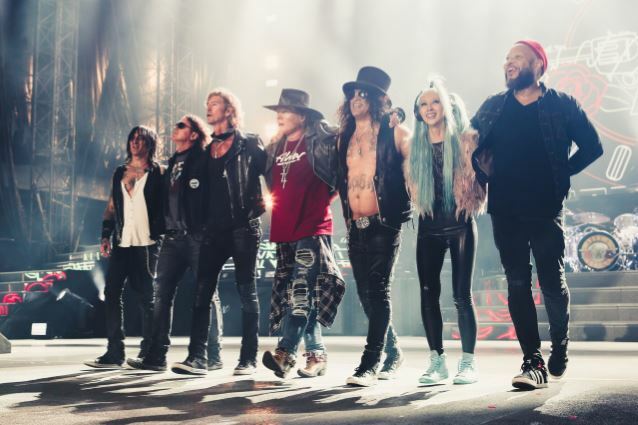 GUNS N' ROSES currently has shows booked in Japan, New Zealand, Australia, Singapore, Thailand and United Arab Emirates between January and early March, with a European tour rumored to be kicking off in July.